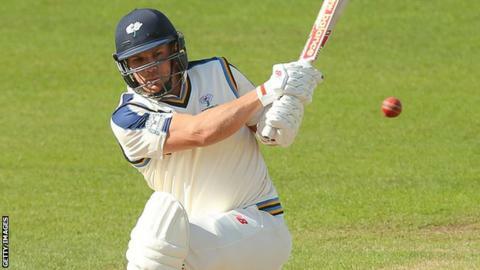 Australian batsman Aaron Finch is hopeful of playing a part in Yorkshire's County Championship run-in. The 28-year-old was expected to miss the rest of the season after suffering a fractured foot in July. Prior to his injury he had struggled for form at Headingley, averaging just 12.66 in the T20 Blast. He tweeted: "I've just arrived back at Yorkshire for the last few weeks of the season! Can't wait to play again after a few frustrating months!" Jason Gillespie's side are currently 38 points clear at the top of the County Championship and are in the quarter-finals of the One-Day Cup. Finch's injury saw him left out of the Australia squad for the upcoming One-Day series with England.